The Nuart movie theatre, in West LA, provides The Chef his fix of Jean-Luc Godard reissues. 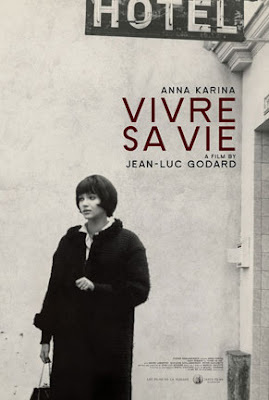 This week "Vivre Sa Vie" from 1962 is playing through Thursday; shot in black and white and starring La Nouvelle Vague siren Anna Karina. The Chef loves 1960's French New Wave films, especially early Godard -- like The 99 Cent Chef, he tosses all rules out the window. Story, acting, shooting, editing, graphics and music are refreshingly scrambled, stretched and chopped up - unpredictable. Godard on the big screen is a rare treat The Chef will not miss. 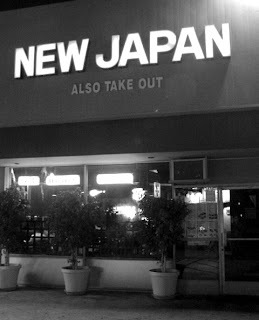 Directly across the street from the Nuart, in a strip mall next to a 7/ll, is the Japanese restaurant New Japan. After ordering, The Chef cradles a brimming sake cup by a window seat and watches in puzzlement as Nuart moviegoers queue up on a chilly Fall night, waiting in line for the movie to start; don't they know just across the street awaits hot sake? The Nuart seldom sells out, so if you are in line for the 7:30 PM showing tonight, please join The Chef across the street instead; where he will be dining on a favorite dish: fried pork cutlet. The panko breadcrumb crust is fried to perfection and the cutlet is presented sliced, served simply with white rice and a green salad. 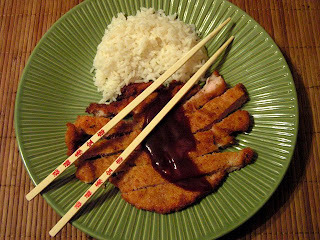 Don't forget to grab the squeeze bottle of Tonkatsu sauce for the cutlet. The Chef tried his hand at this dish. The verdict: his 99 cent version is a Palme d'Or winner, if Cannes awarded entrees. 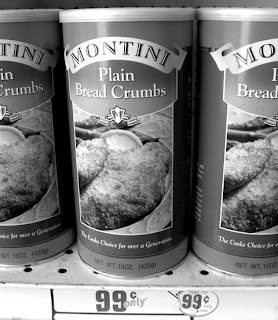 The 99c only Store is selling plain bread crumbs; while not panko it works fine. At my local Latin market, pork sirloin end-cut chops were on sale for 89 cents a pound. Roll film, and action! thickness fry about 5 minutes each side until bread coating is golden brown. Check for doneness with a fork - clear juices. Serve with rice and a simple green salad. Am I losing my mind, or wasn't there a fish recipe posted somewhere a couple days ago? Hi Nate's mom, your sanity is not in jeopardy - yes, The Chef took down the fish recipe to make room for Godard & Cutlet. Please check back later in the week for Homemade Canned Fish Fillets.